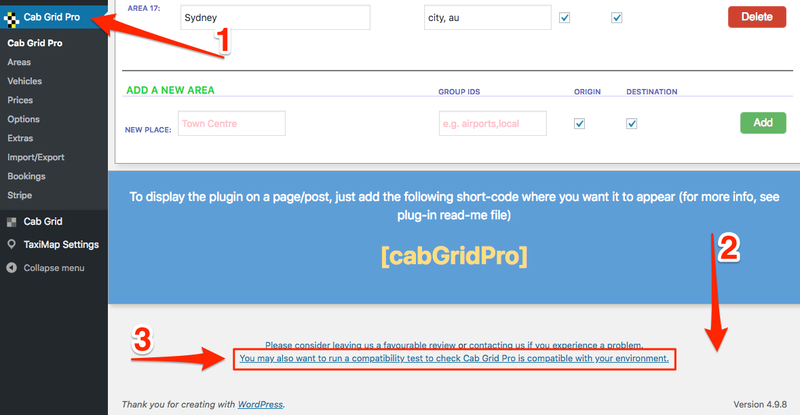 As part of troubleshooting issues with the plugin, Cab Grid has a built in compatibility test. This test can show incompatibility between the hosting environment and Cab Grid Pro. It accessible from the BASIC edition of Cab Grid and from Cab Grid Pro v4 or higher. Review the results on the subsequent page. Cab Grid Pro version 4 and higher includes a compatibility test accessible from the Cab Grid Pro admin pages.